How to safely earn high and growing yields with energy stocks, even if energy prices stay low for several years. 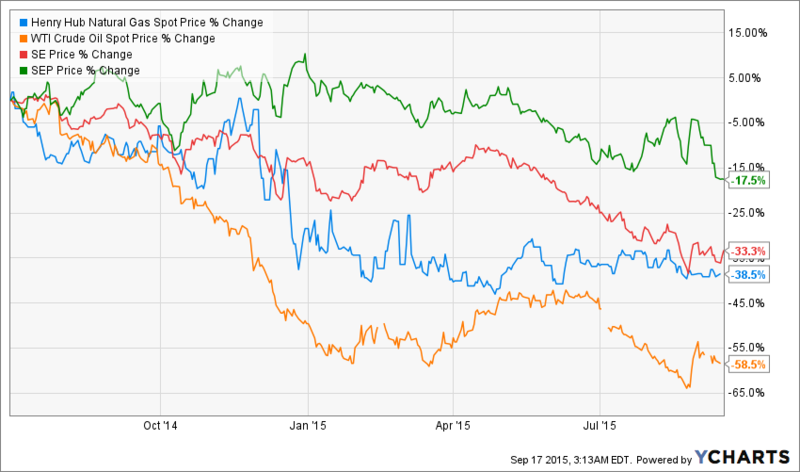 It's no secret that the past year and a half has been cruel to energy investors. Oil and natural gas prices have tanked because of massive supply gluts that have caused Wall Street to hammer MLP general partners -- GPs -- like Spectra Energy Corp (NYSE:SE) and its MLP subsidiary Spectra Energy Partners (NYSE:SEP). In my opinion Wall Street's reaction to the energy crash has been overblown and creates a great buying opportunity for dividend investors to cash in on the superior business model of midstream pipeline operators, a business model that's based on long-term, predictable, and secure tollbooth-style fixed-fee contracts. Let's look at why Spectra Energy Corp and Spectra Energy Partners represent two great ways to get paid handsomely and securely, while we wait for the inevitable energy-price recovery. MLPs are special "pass through" entities that derive at least 90% of gross income from things such as development and transportation of natural resources. Many investors like them because they typically pay substantial distributions -- a kind of dividend -- that the IRS treats differently from regular dividends, which are taxed as ordinary income or long-term capital gains. Essentially, because of heavy depreciation, MLPs often pay out distributions in excess of an investor's share of taxable-income liability.These distributions in excess of taxable income are then treated as return of capital, or ROC. What I love about this MLP's generous yield is just how secure the payout is, even in the face of low energy prices. For instance, In the last quarter, Spectra Energy Partners reported $321 million in distributable cash flow, or DCF -- net income plus depreciation, amortization, and other non-cash expenses minus maintenance capital expenditures. That amounts to $1.08 per unit from which it paid out $0.61 per unit in distributions. Now there are two important things to realize about these numbers. First, Spectra Energy Partners was able to easily cover its distribution with its DCF this quarter -- creating a distribution coverage ratio of 1.77, and anything over 1.1 is generally considered secure, sustainable, and capable of safe growth over time. So not only is this payout very generous -- 5.6% versus the S&P 500's 2.1% yield -- but, because of Spectra's long-term contracted fee-based cash flows, it's also mostly immune to changing energy prices. Second, a certain proportion of the distribution is considered a return on capital by the IRS which has several major tax advantages. The amount taxed and the amount designated as ROC are sent to you in a schedule K-1 form annually around tax time. General partners are regular C-corps that manage an MLP and pay qualified dividends. In Spectra's case, Spectra Energy Corp is the GP, which means its owns a 2% GP stake, incentive distribution rights, or IDRs, and a certain proportion of its MLP's limited units -- 81% at the end of June. Spectra Energy Corp's business model is to help finance the acquisition and development of new assets and then "drop down" or sell them to Spectra Energy Partners -- as well as DCP Midstream Partners, which it co-owns with Phillips 66 -- in order to grow Spectra Energy Partners' DCF and distribution. The IDRs ensure that 50% of marginal DCF flows back to Spectra Energy Corp, and since it also owns 81% of its MLP's normal distribution paying limited units, the vast majority of DCF that Spectra Energy Partners generates winds up back in its GP's coffers. This means that over the long-term Spectra Energy Corp can afford to sustainably grow its dividend faster than its MLP can grow its distribution; which is one of the reasons to consider it for your diversified income portfolio. Helping to secure Spectra Energy's future growth is the fact that it has over $20 billion of mostly fee-based projects it plans to bring online, $6 billion of which Spectra Energy Partners is funding over the next five years. That should ensure strong growth in super-steady cash flow for both Spectra Energy Corp and its MLP, even if energy prices remain low for several years. Spectra Energy Partners and Spectra Energy Corp are two great examples of why midstream MLPs and their general partners make for such great high-yield income growth investments, even when energy prices are crashing. With their cash flow protected from violent commodity swings by long-term fee based contracts and DCF growth all but assured due to massive growth projects coming online within the next few years, I'd recommend income investors use Wall Street's short-sighted fear as a great long-term buying opportunity.